Heritage Bank is set to open on Decoursey Avenue in Latonia in the building that most recently housed the corporate headquarters of Duck Manor Promotions which moved all its offices a block south. A vice president and branch manager from Hertiage were the featured guests at Covington After Hours, the monthly get-together sponsored by the Center for Great Neighborhoods, the Friends of Covington, the Latonia Business Association, and the Mainstrasse Village Association. Wednesday's After Hours was held at the Green Lantern at 39th & Decoursey which recently reopened under new ownership (a story on that will soon follow here at RCN). "We are a community bank. Every one of our employees lives in Northern Kentucky," said John Nienaber, a Covington native and a vice president with Heritage. "There is local decision-making, local people who know where Covington is, who know where Rosedale is. It really makes a difference." Heritage was founded in Northern Kentucky in 1990 and grew from $4 million in assets to near $500 million. "It's been very steady growth," said Shane McQueary, who will manage the new branch and continued the theme that Hertiage is a community-based bank. "If you come in the bank we know you by your first name." 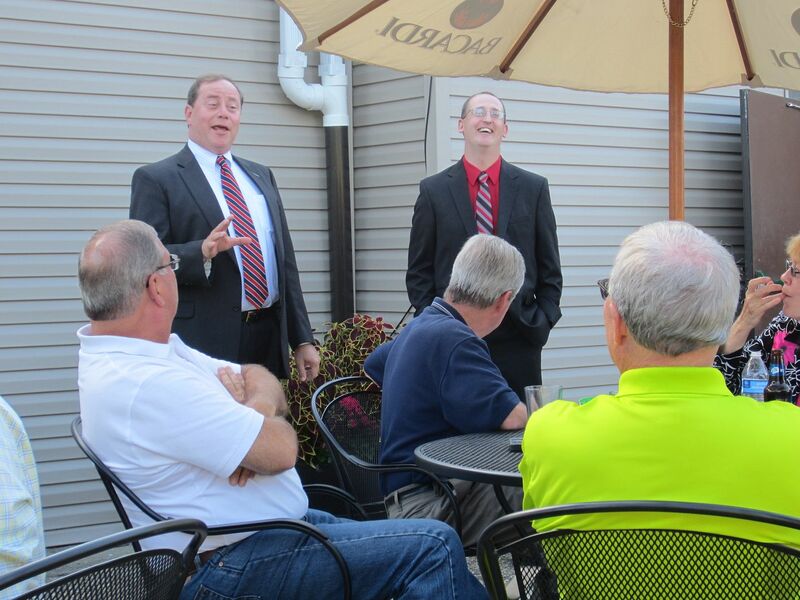 John Nienaber (left) and Shane McQueary address the Covington After Hours event. Kenton Co. Judge-Exec Steve Arlinghaus is seated left and former Covington Mayor Butch Callery is in the foreground. If you go in the bank on Friday morning, you get complimentary donuts, and cookies in the afternoon, McQueary said. Latonia will be the bank's sixteenth Northern Kentucky location. It expects to open by September 1. Duck Manor, meanwhile, has been in operations since 1995 when it was founded by Tom Ellis. It specializes in promotional products and apparel with logos on them.